I’m what you’d call a “small-time climber”. I used to get drunk on Arthur’s Seat a lot, and am occasionally known to change lightbulbs and hang things using a cheeky ladder or two. But despite my solid credentials, I haven’t got the first inkling as to why someone might upgrade from ‘Ladder’ to ‘Pile of rocks .. and death’, and although Touching the Void certainly gave me an insight into those who do, I can’t say I left as a Gore-Tex convert. Touching the Void, from director Tom Morris and based on the book by Joe Simpson, follows climbers Joe (Josh Williams) and Simon (Edward Hayter), who face true calamity on their descent of the Siula Grande mountain in the Peruvian Andes. The plot is fairly complex from a “Who’s doing what, when?” perspective, but the most basic synopsis without spoilers is: things don’t go amazingly well. What follows is an excruciating story of sweat and almost supernatural human will – and even if the details tell you how it ends, it’s still a hell of a ride. What works in this show is incredibly clear from the get-go: it’s a spectacle. The Carroll-esque flock of chairs floating above a neon jukebox, the unnerving dark abyss created only by light and sheets, the climbable, rotating metal strut cliff face. As just something to watch, this show is an utter delight. 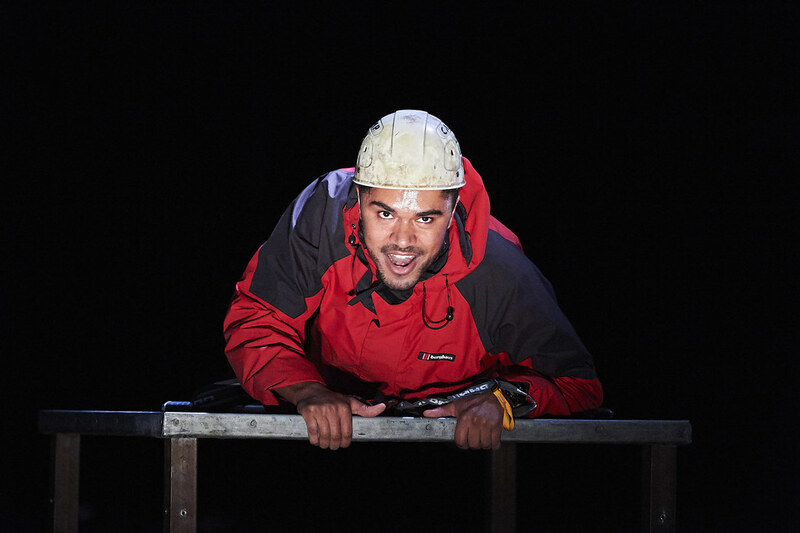 Actors, obviously trained to the point of safety, almost seem a dynamic part of the scenery as they scrambled, hung and climbed over places I’d never even seen lit on a Lyceum stage before. 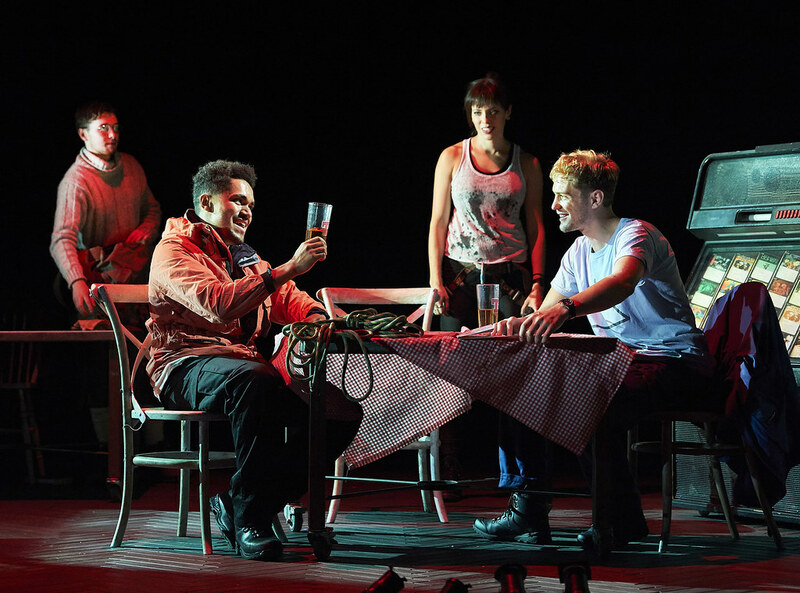 Forget the plot – the performances told an unspoken story of sweat and suffering before the play even began. The theme of spectacle returns once again if we concentrate on the acting. Each of the four characters had at least one moment where it was abundantly clear why they had been chosen for the role. Fiona Hampton (as Sarah, Joe’s sister) even got some tears from my theatre partner that night, using nothing but an empty stage and a letter. My personal MVP goes to Josh Williams, however, if only for the sheer grit it must’ve taken to drag himself around the stage and still emote realistically for a solid forty minutes. All good news for the theatre-going public. However, as this show quite emphatically demonstrates, for every climb there is a fall. And unfortunately, there were a few trenches that this production did not seem to have the will to climb out of. I wanted to like this show. I liked the ideas at play, I loved the staging – but I have never seen a show so willing to undercut its own potential excellence for seemingly no reason. The source material is jaw dropping and the actors are clearly talented, and the play is full of moments which if left to stand on their own, within their moment, are powerful. But for some reason it seems like it doesn’t have enough confidence that they will stand, and so things are extended, or repeated or just simply cluttered up and sabotaged by so many different elements that the simplicity and effectiveness of the particular is lost. This happens consistently: one of the most frustrating examples includes a tense and exciting scene of Joe and Simon battling a storm on a cliff face, which was then overlaid with Patrick McNamee’s soothing, folksy twang, quipping merrily around like he’d spent his time offstage pounding hash and Ordnance Maps. Or, even worse, a legitimately good scene just simply goes on too long. A painful scene of a man dragging his broken body across a rock ridge is harrowing for ten minutes of sobbing and inching, but after twenty with little more than a weird song (we will get to those), it feels a lot more like filler than chiller. But most frustrating of all were the dances and choral spoken word. In amongst what is clearly a physically capable and dedicated cast with choreographers who can achieve so much in other areas, it baffles me why numbers like an unexpected spoken word rap about Ice Axe technique could not only mismatch tonally but also feel as if they’d barely been choreographed at all. The use of repetition and spoken word material has the potential to be well done, but at best it breaks the play’s natural flow, and at worst is actually a little boring after the third chorus of “Because it’s [F -ing] there”. More than anything else, this was a disappointing show. All the more so because those glittering moments of excellence weren’t just in my privileged reviewer dreams but are there on stage – for just a second. It feels as if this production could have been much more than it was, and didn’t trust the talent it had and the story it adapted. Looking at other reviews it seems I’m quite lonely here on my Portaledge. 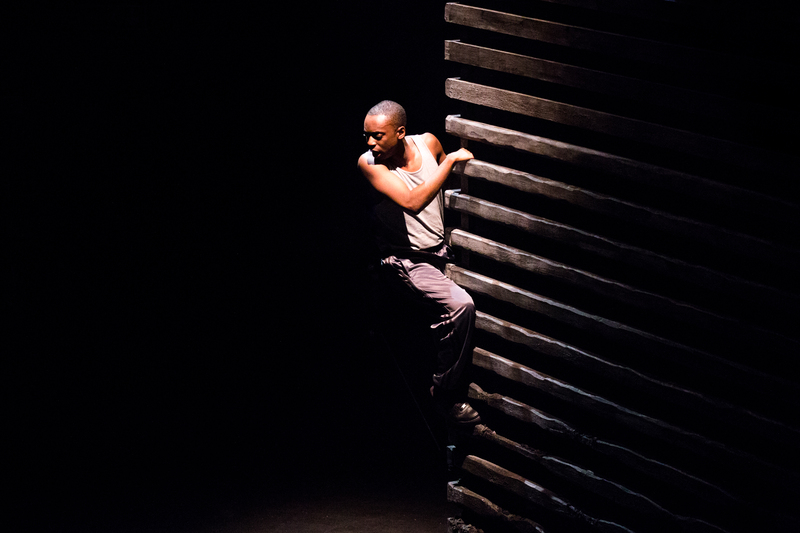 Maybe I just don’t get it, but knowing that less is definitely more for Alpine Climbers, I found myself longing for it to be the same of theatre adaptations as well. Do politicians reach Valhalla, that great hall of slain warriors? No, they don’t, and Ronan Jennings’ valiant play shows why. You need to be dead, mighty, and Norse. Jennings’ principal candidate has led a bloody revolution, for sure, but he has a French name and is stuck behind a desk. Still, Joy Division’s Candidate plays on from 1979 and provides the sombre mood music. Twelve Twelve Theatre’s production is in the Wee Red Bar in the College of Art. It is a handy space but with no stage as such and with only a minimal set it is unfortunately not equipped to suggest the final overthrow of the Imperials by a people’s army. Four characters find their way through unseen rubble to the seat of power, the old imperial palace that has its vodka store miraculously intact. Guillaume (resolute and deluded by Andrew Johns Cameron) may have won the war but he is plainly rubbish at making peace. ‘His’ city, Belogard, is without water and riots are around every corner. His bright idea to arm the citizenry is not working out as he hoped. Three women would oppose this megalomaniac, each one – in my book – worthy of a place in Folkvangr, the other Valhalla, presided over by Freyja. Eloise (Hana Mackenzie) is trapped between loyalty to the Leader and a winning humanity; Ingrid (Debi Pirie) has the best lines when she rounds on Guillaume, the born-again fascist; and Zaitsev (Christina Kostopoulou), a cool emissary from a neighbouring state who is there to seize a favourable trade deal from a country in ruins. Surely an available Brexit analogy here? Forget lofty mythology and Imperial Stormtroopers; the whole idea is too big, too self-important. It helps if you scale Valhalla down, away from chemical weapons and child soldiers, down to comic strip frames. There’s a nasty Colonel Boris in Herge’s child-satirical King Ottokar’s Sceptre and that’s where I see this piece, in 1938, where a plot to overthrow a good ruler is discovered and thwarted (by Tintin and his wee dog). Guillaume, like Hitler, has penned his own Memoirs of the Common Man. The best is in determined acting, the brutality of a couple of confrontations, and Guillaume’s laughable ignorance of what-to-do-next. Economics is not a minefield that he’s happy in. The worst is in the reduction of history to pop pistols and bombast like ‘tackling a wolf in single combat is the way to high office’, even though Odin would applaud. Regardless, I look forward to more of TwelveTwelve Theatre’s bold programming and productions. Oddly, there are more shows than ever this year where I personally have felt a performer is too good for the show they are starring in. This is particularly true of Melissa Mahoney and Solarplexus: An Alternative Energy Play. The show, written by Michael Galligan, deals with a near-future where solar fires are plaguing Earth and a mega-corporation known as Syzygy has proffered a ‘solution’ to the problem by creating a giant space station that will bathe the world in constant daylight. A genius inventor/farmer/tin-foil-hat wearer (played by Gilligan), however, has made an energy-producing bike named Mercury Daniels, that can somehow stop all of this and save the world. His daughter, Ellen (Mahoney), contacts him and tries to help stop the plot, while his son Frank (Sam Metzger) has started working for the corporation and its evil boss (Justin Picado), leading to a frenetic mission and intergalactic madness. There are standout elements of this show that really shine. Mahoney, first and foremost, delivers a strong performance and an excellent onstage presence; she holds the show together in more ways than one. Another stellar presence in the production is Justin Picado, multi-roling as the maddened Syzygy CEO, a messenger from the Sun, and a few other surreal presences; Picado has very clever comic timing and physicality, and similarly to Mahoney, could and should really knock it out of the park if given more compelling lines to perform. Also onstage but in the corner is composer Robert Fernandez, who live-scores the show with remarkably fun musical motifs and sounds. Credit to director Jaye Hunt for placing him in view of the audience, for most of the entertainment in the show can be derived from watching him work. The rest of the production is unfortunately a let-down. The plot dissolves into flat, unconvincing absurdity, which could be entertainingly surreal if it was not constantly interrupted by uninteresting arguments and character moments. The constant bickering between Ellen and Frank, as siblings who took very different paths in life, possibly due to their father’s treatment, is so overplayed it becomes simply irritating to listen to. The same jabs and judgements are repeated over and over and over, never improving in form or content; the interjections from their father, also played by Galligan, do not particularly help, possibly because his characterisation seems straight out of the notoriously neglectful Rick from Justin Roiland’s Rick And Morty. Some lines and concepts are fascinating, yet most are delivered during the intermittent cacophonies of the characters simply talking over each other, so they have little impact. The jokes, of which there are surprisingly few, are also quite unmemorable; thankfully, Mahoney and Picado are quite good at stepping in to save the moment when certain punchlines fall conspicuously flat. Solarplexus is an odd watch, and contains some affectingly haunting musings on what could result in the end of the world: corporate greed, public disinterest, and personal irresponsibility. Yet though these concepts are raised, the show is not particularly risible to an audience, and perhaps could do with a slight rewrite and a more dynamic second half. Writer-director Matt Palmer’s depiction of a rural Highland town and its inhabitants is not doing the Scottish tourism board any favours. 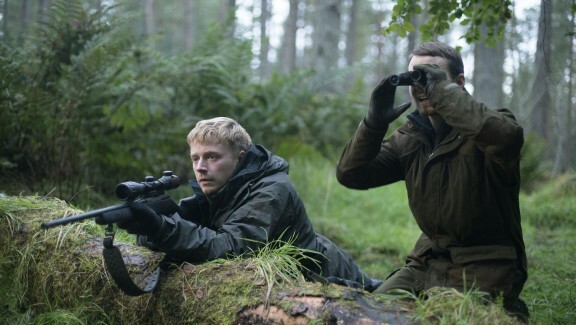 His new film, Calibre, out on Netflix in a week, walks the line between outright horror and pulse-pounding masculine drama with notable style, and gives rising star Jack Lowden some seriously grisly meat to chew on. Overall, however, this tidy, affecting morality play with an impressive cast and excellent sound work cannot escape some garishly ill-devised plotting, a tiresome amount of doom and gloom, and a seriously terrible haircut. The fun begins in Edinburgh, as Vaughn (Lowden), kisses his pregnant wife goodbye for a weekend hunting in the Highlands with his lifelong friend Marcus (Martin McCann). Upon their arrival in the rural town, they cross paths with aggressive locals, dangerous women, and some surprisingly friendly contacts. Palmer builds a commendably unnerving sense of dread as every craggy corner in this middle-of-nowhere locale seems to possess some unseen malice, and the director’s horror influences are well-established early on. At times one expects some glowing eyes or demonic cackle to make an appearance but Palmer’s film avoids the supernatural in favor of the more horrifying type of evil: the one within man himself. If that last line struck you as a bit much, take it as a test. If that sort of melodramatic meditation on evil! and honor! and truth! and shame! strikes you as a fun time, maybe you’d love Calibre. If the line “This can only be paid for in blood” doesn’t strike you as laughable, by all means get on Netflix on June 29th and stream this thing. Otherwise, take my word for it, this film is poorly measured. Lowden turns in another commendable performance as Vaughn, who commits a horrendous act completely by accident, which is so genuinely shocking that I won’t dare ruin the surprise when it comes. McCann is impressive as the cunning and duplicitous Marcus, who is unnervingly good at covering their tracks after the act, which implicates both of them in heinous wrongdoing and will completely destroy both their lives if discovered. Also delivering the goods is Tony Curran, a reliable presence on screen, who gives great depth to local leader Logan, who keeps the most brick-headed townsfolk from tearing the city boys to shreds just for being outsiders. Palmer clearly has a nice grasp on how to build tension, and he is particularly impressive in his use of sound to set a scene. But Calibre would be vastly better if it knew how to release that tension in its final act without lazing into tasteless impulses. Skip it, I reckon.